MANILA, Philippines – Gilas Pilipinas had established a most needed momentum after sealing a win against the resilient Japanese yesterday in preparation for their FIBA World Cup Qualifiers rematch against the defending champions, Team Iran led by ex-NBA player Hammed Haddadi. Team Pilipinas shocked Haddadi and the rest of Team Iran with a 14-point, 87-73 win on Monday, September 28, 2015. Haddadi outjumped Andray Blatche in the opening tipoff for Iran’s 1st possession of the ball game. Medi Kamrani immediately drained a three-pointer for the early lead. In return, Blatche placed team Philippines on the scoreboard by sinking his 2 foul shots and got Haddadi’s 1st personal foul. Jason Castro-William was left open in the middle for the short floater to get the 4-3 lead. But Nikkha Bahrami was too quick to retaliate from the 3-point territory. It was a total slugfest, as Jason “The Blur” Castro-William continued to penetrate the middle, right in front of Haddadi while Medi Kamrani did the same for the opposite side. Philippines got into an early trouble when Andray Blatche committed his 2nd personal foul on Hammed Haddadi. Iran called its 1st timeout after Jason Castro-William hit them with a wide-opened trey from the upper right of the arc. Gilas was up 17-11. Nikkah Bahrami, who didn’t play at the Jones Cup was slowly heating up from the downtown to close the gap to just a point. Just like Blatche, Bahrami gained his 2nd personal of the game after hacking Asi Taulava under the rim. Taulava made his 2 charities to regain Gilas’ 3-point lead. Mashayekhi grabbed the lead for Iran after scoring a trey and a fast break layup successively that prompted Coach Tab Baldwin to bring Andray Blatche in along with Sonny Thoss for defensive purposes. Jamshidi Jafarabadi scored another fast break layup to end the opening period with a 3-point lead, 25-22. Gilas started the 2nd quarter without Andray Blatche and Iran capitalized on his absence and made a living underneath the basket. Blatche re-entered the ball game and promptly hit a long bomb for the equalizer 27 apiece. Amazingly, Blatche was able to contain Haddadi at the front court several times while protecting his 2 personal fouls. Hammed Haddadi and Medi Kamrani combined efforts to elevate their lead to 6 but Terrence Romeo and Calvin Abueva countered them to cut the margin to just 1, 33-32 with 4 more minutes remaining in the 1st half. Dondon Hontiveros consumed Philippines’ 5th team foul after fouling Bahrami. Luckily, he missed his 2 free throws. Nikkah Bahrami atoned himself by getting an and one from Taulava. 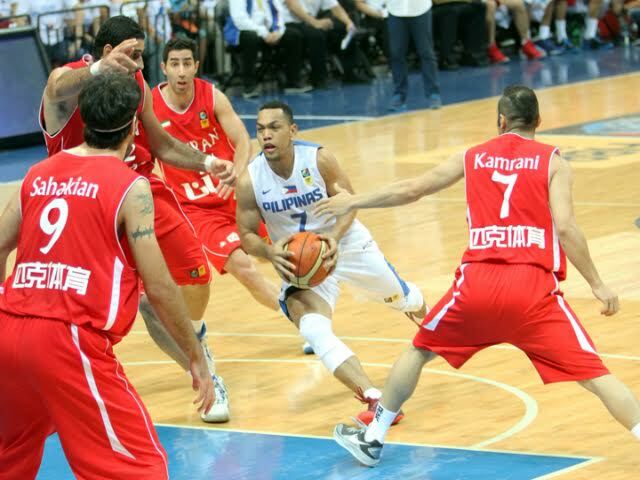 Iran took advantage of Blatche’s absence once again combined with Gilas’ costly turnovers. Team Captain Nikkah Bahrami sank another trey and posted Iran’s biggest lead of the half with 8 points under 2 minutes. Philippines started to miss from everywhere since Andray Blatche sat on the bench to nurse his 2 personals but finally got one from downtown as Ranidel de Ocampo beat the half time buzzer and trimmed the lead to just 6 points 43-37 heading to the dugout. Coach Baldwin started the 2nd half with his usual starters and hoped for an offensive onslaught. Nikkha Bahrami tallied his 16th point of the game and escalated Iran’s lead to 10 from the rainbow area. Jason Castro-William, the Best Point Guard in Asia started to take charge of the scoring chores along with his big man Andray Blatche. In less than 2 minutes, Philippines blitzed for a 7-0 run and brought down the double-digit lead to just 3 with 6 more minutes remaining in the quarter. Blatche showed the Iranians that they’re not the same team that they have faced couple of month ago at the Jones Cup. The 6’11 center blocked Kamrani and converted it into 2 points off transition. Dondon Hontiveros knocked down a three-pointer to level the scores to 52-all. This was the right time for Coach Baldwin to rest his starters and field in his 2nd unit. Fortunately, the other unit led by Terrence Romeo, sustained the adrenaline rush, he hit 2 treys for the 58-57 lead. Calvin “The Beast” Abueva, contributed significant numbers in the third to give Philippines a 5-point lead, 65-60 entering to the 4th and final period. Jason Castro-William started the final canto of the game with an uncontested triple in the middle followed by a drive plus a foul against Nikkha Bahrami. Abueva got Haddadi’s 3rd personal for another Philippines - and one play. Abueva completed the 3-point play and put Gilas on top by 7 points, 74-67. Andray Blatche hit a bank shot to give Philippines its biggest lead of the game with 8. Abueva, Gilas’ energy guy stripped a ball away from Bahrami and took it all the way with Hammed Haddadi in front of him. Calvin missed the layup but got the Iranian giant’s 4th personal foul. Haddadi kept on complaining on the officials and was slapped with a Technical Foul that gave him his 5th and last foul of the day. Abueva hit the bonus shots for the 11-point, 78-67 lead. “The Blur” with a veteran mindset, protected the ball and melted the clock with his team up by 12. Castro-William posted a game high of 23 points. Blatche came back to hold on their double-digit lead and secure a victory over the Iran. Terrence Romeo and Calvin Abueva placed the icing on the cake by making their foul shots. Philippines gave Iran its first loss of the tournament to the tune of 87-73 convincing win.